Seven years since a revolution that ended four decades of dictatorship under Moamer Kadhafi, Libyans see no end in sight to the North African nation’s chaotic transition to democracy. A UN-backed unity government has failed to assert its authority across the oil-rich country, which is still grappling with deadly attacks, a struggling economy and a migration crisis. Authorities in the capital Tripoli have planned celebrations on Saturday to mark the seventh anniversary of the start of protests on February 17, 2011 that led to the toppling and killing of Kadhafi. But the festivities come as persistent insecurity and economic woes feed despair, particularly among Libyan youth. Hamdi al-Beshir, 17, said he has been waiting for democracy for seven years. “I can’t wait 42 years like my father did with Moamer,” he said. “I have no intention of waiting for them to steal away my youth and life,” said the teenager who works in a shop selling clothes. Since 2011, Libya has been a key gateway for migrants trying to reach Europe, with tens of thousands paying people smugglers to cross the Mediterranean illegally, often on unseaworthy boats. Thousands have drowned attempting to make the journey, while thousands more have been detained in the North African country, drawing criticism from rights groups over alleged mistreatment and abuse. Libya descended into chaos after the 2011 NATO-backed revolt, with rival militias and tribes — but also jihadists — vying for influence across the country. A 2015 UN-backed deal to set up the unity government in Tripoli was meant to end the turmoil. But Libya has remained riven by divisions between that government and a rival administration backed by military strongman Khalifa Haftar in the east. Forces allied with the unity government expelled the Islamic State group from the coastal city of Sirte in 2016, but the jihadists still pose a threat from their desert hideouts. UN envoy Ghassan Salame said this month he hoped for parliamentary and presidential elections in Libya by the end of 2018, but warned conditions were not yet ready for polling. Haftar — whose forces have fought jihadists in the east of the country — has supported holding elections although it is not clear if he would stand as a candidate. Opponents of the strongman, who is backed by Egypt and the UAE, accuse him of wanting to establish a military dictatorship, while supporters have called for him to take control by “popular mandate”. 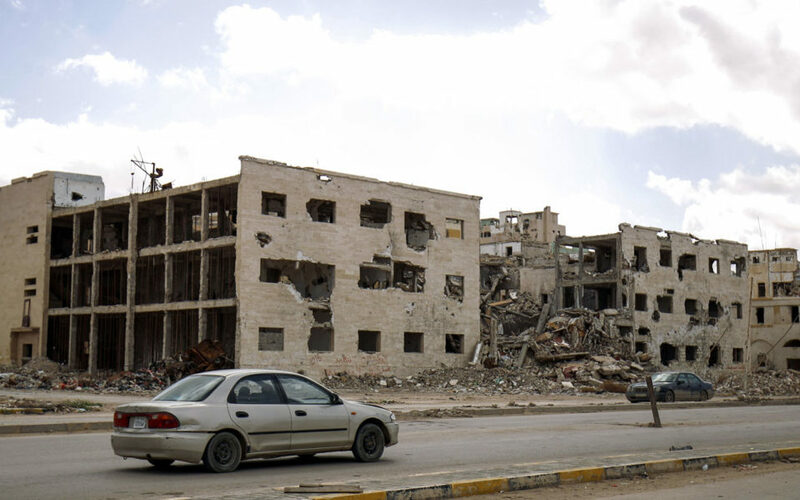 Haftar’s forces last year expelled jihadists from Libya’s second city Benghazi, considered the birthplace of the revolution that ousted Kadhafi, but deadly bombings have since rocked the eastern city. Some analysts warn that elections could further complicate the situation. Previous efforts to stem the strife have come up against the opposition of a myriad of factions which switch allegiances according to their interests. Earlier in February, an armed group blocked hundreds of families from returning to their western hometown of Tawergha despite a deal struck by the unity government and United Nations. They had been chased from the town after being accused of supporting Kadhafi’s regime in 2011. As pointed out by Federica Saini Fasanotti of the Washington-based Brookings Institute think-tank, democracies are not born overnight. “Processes of democratisation are — as history teaches us — always long, cruel and very difficult,” she said. For now, Libyans live to the rhythm of electricity cuts and long queues outside banks, as the country struggles with a cash crunch and an unprecedented drop in the value of its currency. This comes despite an increase in crude sales, which analysts see as key to kickstarting Libya’s moribund economy and returning security to the country. Libya’s oil revenues more than tripled in 2017 despite the violence and political instability — though they are still a fraction of crude sales under Kadhafi.